Homer has 1 media appearance. Stephen Mitchell discusses The Iliad. Anthony D’Aries received the 2010 PEN/New England Discovery Award in Nonfiction. He is a graduate of the Stonecoast MFA program and currently teaches literacy and creative writing in correctional facilities in Massachusetts. Homer, The Iliad / The Odyssey. 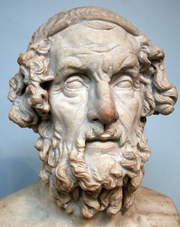 Homer's book The Iliad was available from LibraryThing Early Reviewers. Homer is currently considered a "single author." If one or more works are by a distinct, homonymous authors, go ahead and split the author. Homer is composed of 55 names. You can examine and separate out names.